A great trip suitable for anyone including families with young kids. It is located in a very warm area thus not recommended during July and August. During those months it is blowing very hard as well making the trip challenging some times (wind can get up to 100+ km/hour). 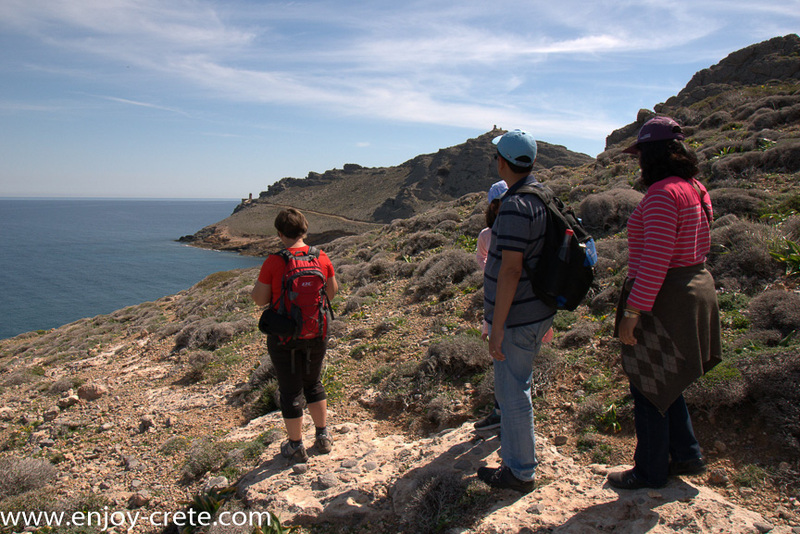 At the end of the hike there is an impressive lighthouse.The lighthouse of Cape St John or Aforesmenos is located 87km northeast of Heraklion , next to the village Vrouchas and the wind farm of Baboura. 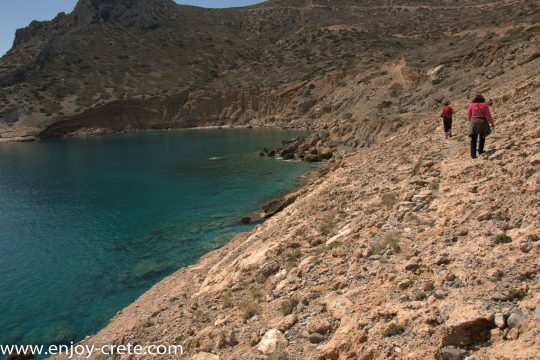 The lighthouse can be accessed via a passable dirt track that starts from the wind farm and, then, a short trail that runs along the cliffs (some years ago there was only a trail). 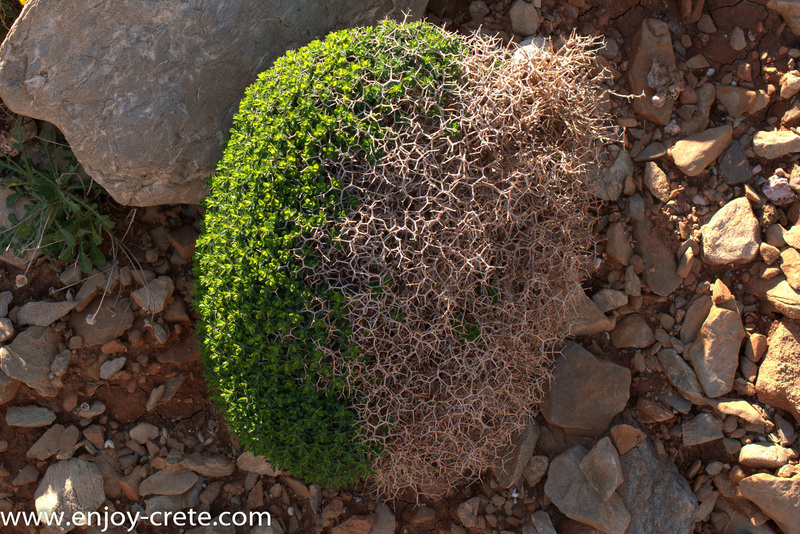 The rugged landscape is typical of Crete with bare mountains, rugged coastlines and too much wind! At Cape Aforesmenos furious winds blow most of the time and it’s strange name (meaning expelled from Church) comes from a relevant reason. According to the legend, after Caiaphas crucified Jesus he started his journey to Rome in order to meet with Caesar. However, during the journey he died of a disease. Because he was a ruler, he should be buried properly. When his sailors approached Crete they tried to reach the little bay of Chomatistra, but the flat sea surface turned to huge waves. Nevertheless, the sailors managed to get out to the coast and buried Caiaphas. Thus, Cape Aforesmenos was named like this denoting that the crucifier of Christ was buried there and the sea did not calm down by then. The lighthouse of Agios Ioannis Cape was built in 1864 by the French Company of Lighthouses at the site of a pre-existing tower. 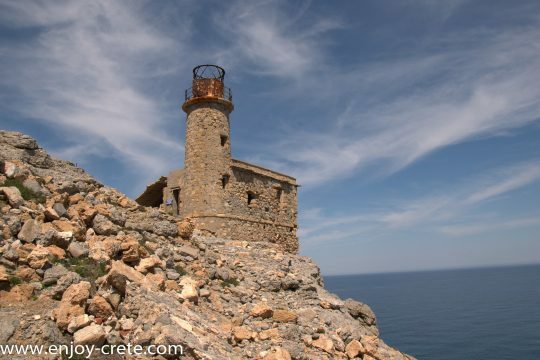 It joined the Greek lighthouses’ network in 1912. Walking towards the cape Aforesmenos. A large part of it has collapsed, while the rest of the building is about to collapse if the state does not take actions immediately. Next to the lighthouse, there is a carved cave which was used by the Germans as a viewpoint. 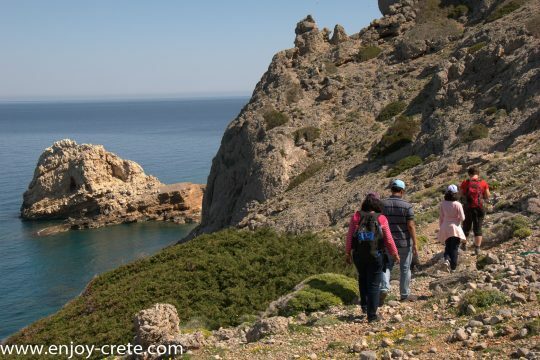 At the top of the hill, where the lighthouse is built, you will see the ruins of a viewpoint drawin in Venetian maps of 1590, which was integrated into the network of Cretan viewpoints. At the wind farm you will see the small whitewashed church of St. John and the remains of the German observatories and the German galleries. In Vrouhas you should visit the old stone windmills, next to the village, and the huge cisterns-well for collecting rainwater. You will need to pack your lunch. Other than that you will need at least 1.5lt of water,sun glasses, hat, sunscreen and a swimsuit if you would like to swim. It will be fine to do this hike with normal sport shoes but hiking shoes are much more recommended due to rocky and sharp terrain. During winter you will need a waterproof jacket and pant plus a fleece jacket. We will pick you up either from Heraklion or anywhere on our way to the starting point which is a few km further than Milatos village. If you do have a car we can meet in the small marina of Milatos. The exact meeting place is as per this link. We start by 10 am. We finish mid day or early evening, the exact time depends the speed of the group and stops. We pick up clients from Heraklion, Chersonissos, Malia, Stalis, Anisara and Milato. Many times we are able to pick up clients from other locations as well but it needs to be on our way to the starting point. If you need transport and you are not sure get in touch with us. Remember to send us the exact location of your hotel, not just the name. Transport is provided for free.